Robert Clive was appointed as the governor of Bengal for the second time in May 1765 with the objective to resolve the increasing problems in India which surfaced after the Battle of Buxar. He was also given the position of the commander in chief of Bengal. As soon as he returned to Bengal as its commander in chief, Robert Clive laid out detailed and extensive plans for reforms. 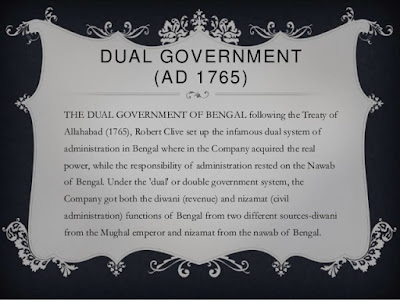 Introduction of Dual system of government in Bengal was the main part of these reforms. After the British victory in the Battle of Buxar, Vensittrat was appointed as the governor of Bengal. In the heat of his victory, he was also tempted to conquer the area of Awadh by removing the Nawab from his throne. But Robert Clive was smarter than him. He did not approve with this idea. He realized that Awadh could prove to be an important territory in the near future due to its crucial location between the British and Maratha territories. The Maratha force was very strong at that time and Robert Clive wanted to avoid an invasion from the Marathas at any cost. So he made Awadh a strong and independent territory such that it would act as a buffer between the British and Maratha territories. He restored the Nawab of Awadh to his throne and in return he received an annual tax of fifty lakh rupees from him. The Nawab also let go off two strong areas which were Kora and Allahabad. Apart from all this, he also promised the British East India Company that he will support and co-operate with them in times of danger. At the same time Robert Clive made a treaty with the Mughal emperor Shah Alam II, according to which the British East India Company would give him the status of the emperor of Delhi. He also convinced the emperor to bestow the Diwani rights upon the company of the territories of Bengal, Bihar and Orissa. Diwani rights means that the Company now had the authority to collect the revenue all these three states. In return for these rights, the company would pay the Mughal emperor twenty six lakh rupees per year. This proposal was accepted by Shah Alam II and hence, the British got control of the revenue of Bengal Bihar and some parts of Orissa which were to the north of river Swarna Rekha. Apart from establishing a strong fiscal status and authority of the British East India Company in the Bengal region, Robert Clive also wanted a strong foundation and status of the company in terms of jurisdiction and politics. To achieve this goal, after the death of Mir Zafar, Robert Clive placed his son Nizam Ud Daula on the Throne of Bengal. Nizam Ud Daula was just a public figure but as far as administration was concern he had no actual power. Clive was determined to distinctly distinguish the status of the Nawab of Bengal, East India Company and the Emperor of Delhi. Therefore he persuaded the Nawab of Bengal to part with the military powers and criminal jurisdiction in Bengal. It was known as Nizamat at that time. Therefore with these Nizamat rights from the Nawab of Bengal and the Diwani rights from the Mughal emperor, the East India Company now had control over the fiscal revenues and the military power of Bengal. This added to their power and stronghold over the entire Bengal region. The Nawab of Bengal was still in charge of the police administration and received 53 lakh rupees from the British East India Company every year. This way, the Bengal administration was divided between the East India Company and the Nawab of Bengal and hence it was called as the dual system of Administration or government. However Robert Clive did not take direct control of Bengal’s administration. He left it in the hands of two deputies which were appointed by the Nawab of Bengal with the approval of the British East India Company. The two deputies were Mahammad Riza Khan who was the deputy Nawab of Bengal and Raja Sitab Roy who was the deputy Nawab of Bihar. The dual administration system was very beneficial for the British because the direct result of such a governing system was that the while the British had all the power in the region, they did not have any of the responsibilities. Civil and police responsibilities rested with the deputy Diwans which were appointed by the Company’s directors. This system had various disadvantages and led to the ultimate breakdown of Bengal’s administration. The local peasants suffered huge losses due to the unreasonable tax structure which proved to be a huge burden on the farmers. There was considerable decline in the agricultural industry. Local handlooms businesses were all but destroyed and trade had become way too costly for the local merchants to continue. The dual system of government served to be beneficial only for a certain period of time as it served the immediate need of circumstances created by the aftermaths of the battle of Buxar. This system brought the Nawab of Bengal under British control which was vital for the British expansion. The Farmans of the local Nawabs carried no weight without the support of the company, but Clive knew that this unofficial control of the British over the Bengal region would be considered as a breach of the international diplomatic etiquette at The Hague (The Dutch Parliament) or at Paris. Therefore, he found the middle ground of dual government through which he could unofficially control the region but at the same time maintain the façade of a local authority still being in power. This way, he would attract much less criticism diplomatically and conduct the company’s business without much interference from the British parliament. This dual system of governance was finally abolished by Warren Hastings in 1772. He reasoned that this system was never meant to be a permanent solution for administration. It was merely a result of tough situations which required an urgent and yet effective solution to the administration struggle in Bengal during 1765. Nowhere in the internet did I find such a good, detailed explanation on dual system. this is great resource. Simply, but clearly explained. thanks a lot!